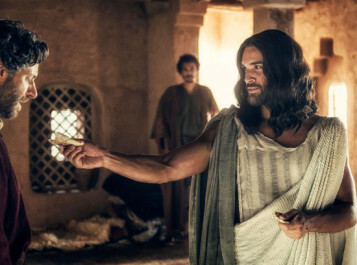 Those who enjoyed the 2013 miniseries The Bible will probably like the new NBC series A.D.: The Bible Continues (Sundays at 9 p.m). Sunday’s premiere episode had all the virtues of its predecessor: excellent production values, strong story lines, solid performances, beautiful cinematography, and subject matter of the greatest possible importance. As its title suggests, A.D. deals with the world in the time of Christ, beginning with the betrayal of Jesus Christ to the church leaders of the time, his public questioning by Pontius Pilate, and his subsequent suffering and crucifixion. But although Christ is at the center of the story, most of the narrative deals with other characters, thoroughly exploring their motivations. It seems evident that this assertion of relative enthusiasm on Pilate’s part is intended to avert complaints of antisemitism of the sort unjustly hurled against Mel Gibson for his The Passion of the Christ. Making Pilate less reluctant to crucify Jesus makes the Jewish leaders of the time seem somewhat less responsible for the unjust punishment of the person thought by many to be their long-prophesied Messiah. Unfortunately, this excess of concern for ethnic sensibilities distorts the story and places too much emphasis on Christ’s political impact instead of his religious and spiritual effect, which was far more momentous at the time. Equally distorting and downright bizarre is the producers’ decision to cast the Apostle John as a black man. There is, of course, no suggestion whatsoever in the Bible that John was anything but an ethnic Jew, and this casting choice creates a continual distraction for anyone who knows anything about the Bible and the Gospel accounts. It is also distracting in that it is an obvious attempt to turn the character into the Black Man as Conscience Figure that is absurdly ubiquitous in the contemporary culture. More interesting is the show’s depiction of Caiaphas, the leader of the Jewish religious community, as he is given rather more attention than the Gospel accounts accord to him. Caiaphas is definitely the main force leading to the crucifixion of Jesus, yet even here the tendency is to deflect blame from the Jews in general. The producers, Roma Downey and Mark Burnett, explore Caiaphas’ motives in much greater detail than the Gospel accounts do, and in doing so, they tend to place the responsibility for Christ’s death at his hands rather than that of the Jewish people as a whole or even the church leadership. Caiaphas is shown telling the other religious leaders that Jesus’ claim to be the son of God is straightforward blasphemy—as of course it must be if it is not true—thus indicating that this one leader is really most at fault. That, too, tends to reduce the responsibility of the Jews for Jesus’ crucifixion, which tends to undermine one presumed foundation for potential antisemitism. That is surely a good effect, though one can easily make the case that the Gospel account allows absolutely no space for antisemitism. It might have taken a bit more work on the writers’ part, but it would have been worth the effort, in my view, as affording a more accurate presentation of the Gospel narrative. Still, the characterization of Caiaphas is interesting and moves the story along well, so on balance it’s effective. The Apostle Peter is depicted well, as is Mary, but the latter’s certainty that Jesus will be resurrected after his death is not found in the Gospel accounts and undermines the effectiveness of the Easter morning narratives in the Gospels, as they gain so much of their effect from the astonishment of the various individuals at Christ’s return. The fact is, the apostles and other disciples would surely have been amazed to see Jesus return from the dead, just as the Gospel accounts indicate they were. To have Mary telling everyone, with great certainty, that he will return, makes the Gospel accounts largely incomprehensible on this score. All of these theological problems are real and have their importance, but by no means are they a reason not to watch A.D.: The Bible Continues. The show gets the important things right: Jesus died on the cross to atone for everyone’s sins, and thus showed God’s infinite love and forgiveness and gives us our greatest insight into God’s nature. The pilot episode leaves no doubt about that, and in so doing, it makes for an enjoyable and inspiring drama.